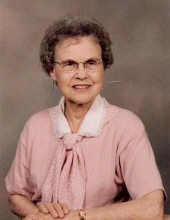 Roberta Evalyn “Bobbie” Pryor, age 96, passed away on Sunday, November 11, 2018 in Republic Nursing and Rehabilitation Center, Republic, Missouri. She was born on January 26, 1922 in Newton, Kansas, the daughter of Pasco and Verda Pearl (Carson) Peelle. She was united in marriage to Guy H. Pryor, Jr. on February 8, 1944 in California. Together, they fostered multiple children and eventually adopted 3 children of their own, James Sr., Patti and Lori. Bobbie was an active member, as their organist, at Asbury United Methodist Church in Springfield, Missouri. She also taught piano lessons for many, many years. Bobbie is survived by her children and their families: Daughter Patti and her husband Gib Rader of Marionville, Missouri; granddaughter Robbie, husband Adam Doerhoff and great grandson Jon Carl Doerhoff of Hallsville, Missouri; granddaughter Vicki and husband Jeff Schiman and great grandchildren Maci and Kalli Schiman, of Marionville, Missouri. Son James and his wife Charla Pryor of Moore, Oklahoma; granddaughter Melissa Pryor and great grandchildren Jasmine, Julian and Jaylyne Pryor of Oklahoma; grandson James Pryor, Jr. and great grandchildren James III, Haylee, and Josilyn Pryor of Oklahoma. Daughter Lori and her husband Dave Wheelock of Cassville, Missouri; 4 grandchildren, 12 great grandchildren and 2 great great grandchildren. This obituary was lovingly written by Mrs. Pryor's family. To send flowers or a remembrance gift to the family of ROBERTA EVALYN PRYOR, please visit our Tribute Store. "Email Address" would like to share the life celebration of ROBERTA EVALYN PRYOR. Click on the "link" to go to share a favorite memory or leave a condolence message for the family.